Cake Mania: Baker’s Challenge | Binary Messiah - Reviews for Games, Books, Gadgets and more! CakeMania has the same play style as Diner Dash so fans of that game know what kind of fun they are walking into here. CM’s premise is as follows: You are Cloe who’s grandparents’ cake shop must be torn down due to its age, lack of customers, and not being up to code. So, as the sweet girl Cloe is, she decides to spice things up at the shop adding new ingredients and working it all by herself. 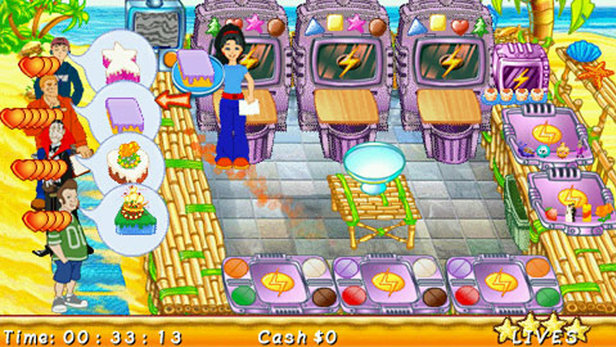 The gameplay is very similar to Diner Dash where you have a step by step style gameplay. A customer comes in, you give him a menu, you wait for him/her to select their cake, you go to the oven and you select the shape they want, after that you carry it to the icing machine and select the color icing, after this they may want a decoration (which you have to end up buying before you can use them). The later stages have you making double stack cakes, but the game isn’t just as simple as all this. You have a certain cash goal you have to make and customers will leave bigger tips depending on their attention level (hearts above their head) so the more hearts the bigger the tip. Some characters have more hearts than others and there are holiday specific cakes and characters. Some characters affect others like Santa adds 1 heart to everyone, and the vampire at Halloween makes them irritated faster. The whole game is about memorization and organization. You have to decide who’s more important than who and bake the cakes accordingly. If you screw up you put the cake on a stand (that you have to buy) so it doesn’t go to waste and usually, a customer will eventually buy it saving you time. If you screw up too much you have to toss the cake costing you money and time. If you take too long customers will get angry and leave losing money in the process. When you finish a stage you can save up and buy new cooking ware such as upgraded ovens, icing machines, a muffin oven to hand out free samples to make customers happier, more decorations etc. This is what keeps you playing CM which is to keep getting further and further, so in turn, the pace keeps going up and so does your cash goal for the day. You get a certain amount of time to pump out cakes before the store closes, so if you have customers left after you close that’s it for the stage. The game has many stages and of course, the game isn’t perfect. While that’s the main concept of the game it’s played out pretty much flawlessly, but it’s everything surrounding it that is average. The graphics are nothing much; just a bunch of drawn up sprites with one or two animations per character, and the game looks and plays like something from a GameBoy Advance or *cough* DS. There aren’t any effects at all unless you count the icing machine’s “spray” an effect. The game’s not ugly, but not pretty to look at either which is a shame. 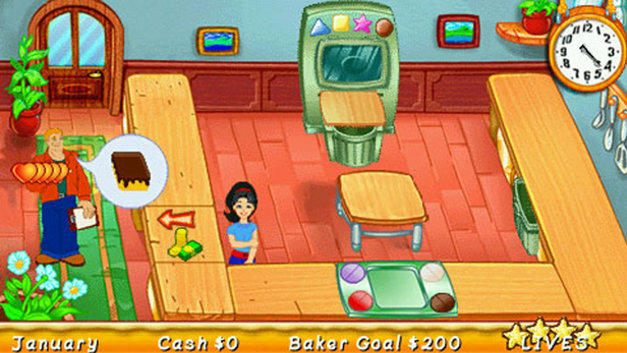 Other games like this such as Cooking Mama and even Brain Age have some 3D elements I don’t know why the Diner Dash engine hasn’t been updated to 3D yet. Thankfully the PSP’s widescreen helps you see everything on screen with ease without any scrolling so this makes things more spread out and not so cramped. The audio is just as plain as the visuals with annoying one-track-repeating BGM, a few whooshing, and whizzing sound effects and that pretty is the whole pie…or cake. So with a retarded story and plain audio and visuals what you have left is a layer of vanilla cake with vanilla icing that tastes good, but doesn’t really make your mouth water. With the cheap price point, you’ll be strangely and sickeningly addicted to this Diner Dash inspired game.